The database dump from the latest metasfresh release is available here. This guide assumes that you already have installed a PostgreSQL server. Note that metasfresh contains more than 1000 tables. Importing the dump might take a while. 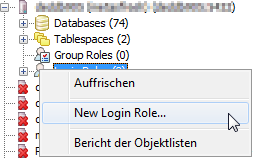 Make sure that the new database is owned by the metasfresh role. Load the database dump into the new database by rightclicking on it and selecting “Restore…”, then follow the dialog. If you have a docker host running locally, you can pull and run the latest metasfresh database in it. To obtain a docker host, you can for example use our vagrant file. See https://github.com/metasfresh/metasfresh-dev/tree/master/vagrant to get started. config.vm.network "forwarded_port", id: "metasfresh-db", guest: 5432 , host: 5432 , host_ip: "127.0.0.1"
To get our latest metasfresh-db and start it up. a settings file which might look like this. The values written here in this documentation are the defaults which the tool assumes if the respective value is missing. By default, the tool will assume the settings file to be ~/local_settings.properties (i.e. usually /home/metasfresh/local_settings.properties). If you need to specify a different settings file, please run sql_remote.sh -h and check out the help message (-d and -s options). Note: it might generally be a good idea to first run sql_remote.sh -h and take a look at the help message. When the tool runs, it scans a directory for SQL files and applies those files that were not yet recorded in the AD_MigrationScript table of the metasfresh database. UPDATE AD_SysConfig SET Value='metas' WHERE AD_SysConfig_ID=50005;  --"PROJECT_ID_PROJECT"
UPDATE AD_SysConfig SET Value='<your-login>' WHERE AD_SysConfig_ID=50006;  --"PROJECT_ID_USER"
UPDATE AD_SysConfig SET Value='<your-password>' WHERE AD_SysConfig_ID=50007; --"PROJECT_ID_PASSWORD"
UPDATE AD_SysConfig SET Value='http://idserver.metas.de/cgi-bin/metas_central_id/get_ID' WHERE AD_SysConfig_ID=50004; --"PROJECT_ID_WEBSITE"
UPDATE AD_SysConfig SET Value='Y' WHERE AD_SysConfig_ID=50010; --"PROJECT_ID_USE_CENTRALIZED_ID"
UPDATE AD_SysConfig SET Value='N' WHERE AD_SysConfig_ID=50009; --"DICTIONARY_ID_USE_CENTRALIZED_ID"
UPDATE AD_SysConfig SET Value='Y' WHERE AD_SysConfig_ID=50015; --"SYSTEM_INSERT_CHANGELOG"
UPDATE AD_SysConfig SET Value='' WHERE AD_SysConfig_ID=50008; --"PROJECT_ID_COMMENTS"
Then, when you insertfor example a new record into AD_Column, the system will obtain a unique AD_Column_ID from idserver.metas.de to make sure that the ID does not collide with another ID from another local DB. The github issue metasfresh/metasfresh#690 is about applying the scripts directly out of your local Eclipse. This comment from issue 690 outlines what aparently needs to be done to achieve this.